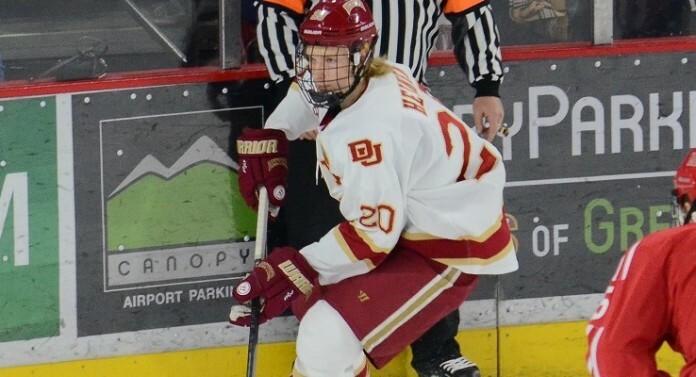 While the attention of the casual hockey fan in Denver might be on the upcoming “Battle on Blake” – the outdoor game that will pit the Denver Pioneers against Colorado College on Feb. 20 – the Pioneers secured two far more important victories this past weekend. With a home sweep of the No. 2 North Dakota Fighting Hawks, the Pioneers inched closer to the top of the NCHC standings where the Hawks currently reside alongside St. Cloud State. With six games remaining before the conference tournament, Denver is just six points behind ND and SCSU. The weekend sweep, send a message that the Pioneers still have their eye on the top of the conference. That message was sent in high-scoring fashion; in the Friday game, the Pioneers won 6-4 followed by another victory on Saturday, 4-1. The Pioneers are hoping they can maintain a frenzied scoring stretch that began in January. Throughout January, the Denver Pioneers outscored their opponents 28-20, going 6-1-3, after coming off a slow start to the season. Their 10 goals in two games is a great start to February. The Pioneers are getting hot at just the right time, led by a breakout season Danton Heinen. 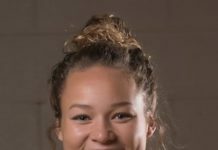 The sophomore recorded a career-high five points (2G, 3A) in the Pioneers’ win on Friday night followed by two assists and four shots on goal on Saturday night’s victory. Heinen became the first Pioneer to tally five points in a single game since Drew Shore did so in 2012, earning him the NCAA’s First Star of the Week. Heinen now has 27 points on 12 goals and 15 assists thus far on the 27-game season. The rivalry between Denver and North Dakota has been one for the books, in fact it dates back to the 1950s. 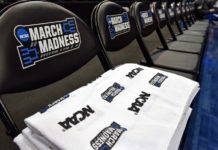 Both teams have won seven NCAA Championships in their program history, putting them tied on the all-time list only behind the University of Michigan who has nine. The Pioneers handed the Fighting Hawks only their second and third road losses of the season, and just their fourth and fifth on the season overall. With a big weekend in the books for the Pioneers, they can focus on the upcoming games this weekend against Colorado College as the two teams will battle it out first at Broadmoor World Arena on Thursday before taking the fight outdoors at Coors Field on Saturday. The Tigers are currently last in the NCHC with only 13 points and Denver swept a prior home-and-home series with them in November. For more information on the Denver Pioneers and the Battle on Blake, visit the Denver Pioneers website.